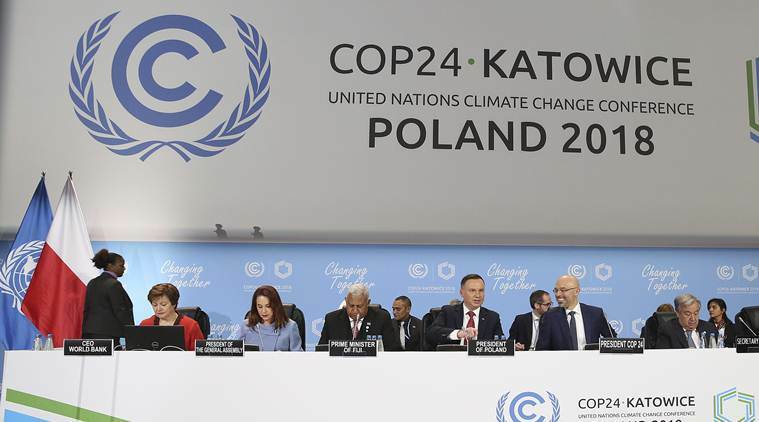 At the COP24 summit India has claimed to achieve its climate targets ahead of schedule and has questioned the spending from developed countries of not being enough to mitigate climate change. The annual UN climate change conference (COP24) has started on December 3 with the goal of finalising the implementation guidelines for the Paris Climate Change Agreement, in which finance is a key component. World leaders have come together for the conference in the Polish city of Katowice that is ironically an important coal mining town. How ‘crucial’ is it for India? The COP24 is very important for India where about 600 million people are at risk from climate change fallouts. India has already experienced extreme weather events such as floods in Kerala, wildfires in Uttarakhand and heat waves in the north and the east, demonstrating its vulnerability. Reinstating India’s commitment to fight climate change, union environment minister Dr Harsh Vardhan on December 3 said it was “crucial” to find ways to combat the issue with the “wisdom of collective cultural tradition” apart from modern technologies. The minister further said that India believes in contribution of citizens, sustainable lifestyles and climate justice provides an alternative means to address climate change which must be “rigorously” pursued. “We will achieve all our targets ahead of our schedule. There is no question about that. We are doing much more than we were expected to do. We are monitoring the progress on these at the highest level… For us (India), climate action is not just a matter of technicalities. For us, it is a moral issue as well,” Dr Harsh Vardhan added. India has set an ambitious target on three fronts. It has pledged to produce 40 pc of its power from non-fossil fuels by 2030. It has also committed to cut down the emissions of greenhouse gases by 33-35 pc from the 2005-levels and create an additional carbon sink of 2.5-3 billion tonnes of carbon dioxide through planting trees. Also India is working hard for achieving its target to get 175 GW power from renewable energy by 2022. India has claimed that developed countries are not spending enough to mitigate the climate change. In a discussion paper titled, ‘3 Essential ‘S’ of Climate Finance – Scope, Scale and Speed: A Reflection’ released on the sidelines of the ongoing conference on December 4, the ministry of finance called for more credible, accurate and verifiable numbers on the exact size of climate finance flows from developed to developing countries. The paper has also claimed that the definitions of climate change finance used in various reports by developed countries were not consistent with the provisions of United Nations Framework Convention on Climate Change (UNFCCC). This apart, the finance which has come through till now is far lower than that originally promised by the developed nations. The World Bank has announced that it would provide needy countries about USD 200 billion between 2021-2025 to help them take more ambitious climate actions, and build resilience against climate change. It said this would almost double its current five-year commitments for climate change. It said that about half of its newly promised money, USD 100 billion, will come from its own resources, while the other half would be from two of its associates, the International Finance Corporation (IFC) and Multilateral Investment Guarantee Agency (MIGA), as well as private funders. However it did not clarify whether the money would be provided in the form of loans or grants. The bank further added that at least 25 pc of this money (USD 50 billion) would be aimed for projects that would support climate adaptation, an area for which countries generally have been reluctant to provide money.